While most Chinese college graduates would prefer to stay in big cities for their careers, Xu Xinkai, a college graduate of Chinese language and literature chose a different road. Xu Xinkai visits villagers in Gu Ronghu Village, Shuanglong Township, Xiangxi Tujia and Miao Autonomous Prefecture of central China’s Hunan Province on May 25, 2018. 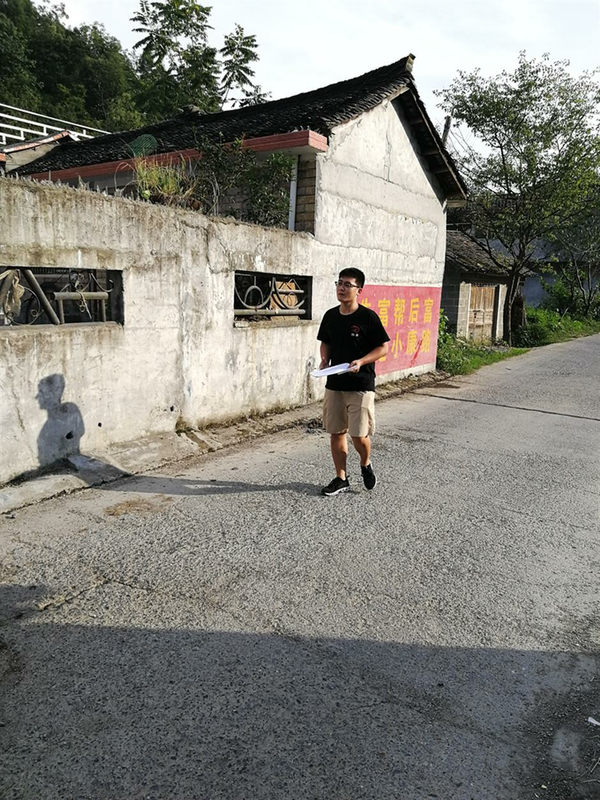 After finishing college in 2017, he became a public servant working in Shuanglong Township in Huayuan County, Xiangxi Tujia and Miao Autonomous Prefecture of central China's Hunan Province where he was tasked with poverty alleviation work. Xu is mainly responsible for archiving documents and updating poverty alleviation data online in his routine work. He also visits villagers living in poverty and inquires about their difficulties and needs, making detailed records and plans out ways to help them. During his stay in Shuanglong Township, he has witnessed much progress made in the local poverty alleviation work. "People's housing security has been guaranteed through renovation of dilapidated houses and relocation. No children drop out of school because of poverty," Xu said in a written interview with Xinhuanet. Speaking of the measures taken by the local government, Xu said effective poverty alleviation projects have been brought in. "The village where I am based has cooperated with a medical company to develop herbs and orchard plantations which can increase villagers' income," he said. "In addition, the vegetable plantation base built by the villagers has made initial success," he added. Science and technology are given priority in fulfilling the task. "Young cadres who are adept at computer skills and familiar with Internet technology are assigned here," said Xu. "This is critical given that young people are creative, quick-minded and full of energy," he noted. "I am confident winning the war against poverty in Shuanglong Township, and I feel very proud of contributing to the work," he said.